On the latest episode of The Grand Tour, Richard Hammond had quite a bit of fun in the Mk8 Ford Fiesta ST. In this quick stunt montage taken from the full episode on Amazon Prime, Hammond tasks various men to backflip over the Fiesta ST, walk a tightrope between the Fiesta ST, and finally, be pushed into a small lake by the Fiesta ST.
We must say, they must have been quite brave considering Hammond’s history of danger on the show. 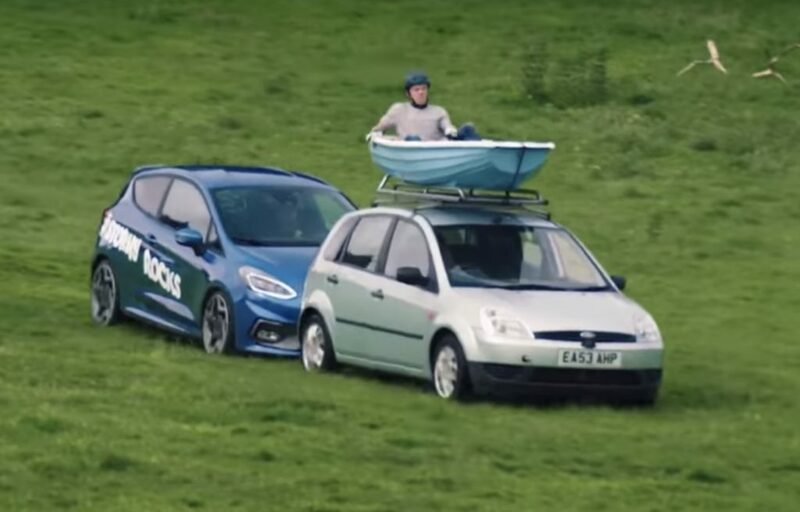 The montage will make more sense if you watch the full episode, but it’s still incredibly entertaining and proves that the Ford Fiesta ST is in fact, a suitable stunt car. The newest episode focus is on celebrating the affordable, practical hot hatchback – and attempting to find out which modern hot hatch best appeals to the younger demographic. 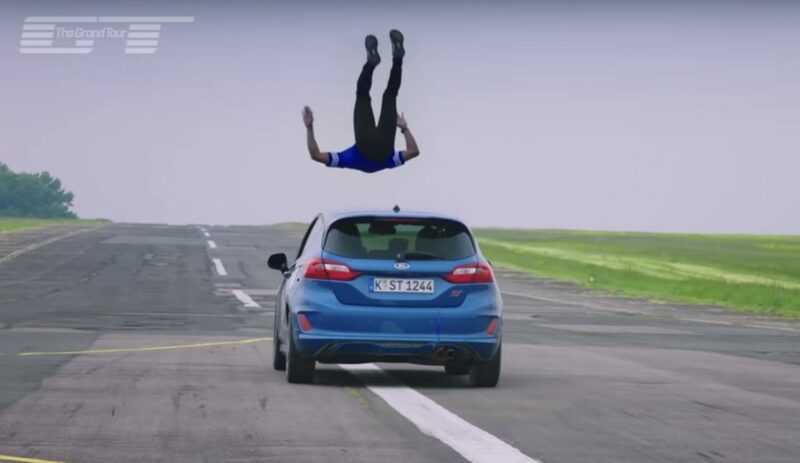 Because of this, Hammond chose to test the worthiness of the new Ford Fiesta ST, and his attempt to appeal to the younger demographic involved this array of stunts, which we must say, are quite impressive. This episode is yet another example of excellent entertainment from the guys both behind and in front of the camera at The Grand Tour, and for Ford fans, a fun and exciting way to show off the new Ford Fiesta ST. The below photo shows the lead-up to Hammond pushing another Ford with a man in a boat attached to the roof. Seriously, just watch and see what happens. What makes the Fiesta ST a great stunt car (and a great track car) starts with its 1.5-liter three-cylinder turbocharged engine that makes 200 horsepower. The Mk8 will do zero to 60 mph in 6.9 seconds thanks to an available limited-slip differential. Shifts come from six-speed manual transmission, drivers are wrapped in sporty Recaro seats, and held on the road highly agile chassis. From all of the critics, it seems that the new FiST is truly an exciting, well-rounded hot hatch that we wish was coming to the U.S. – not so that we could do stunts in it, though. That would be incredibly irresponsible. Subscribe to Ford Authority for ongoing Ford news coverage.